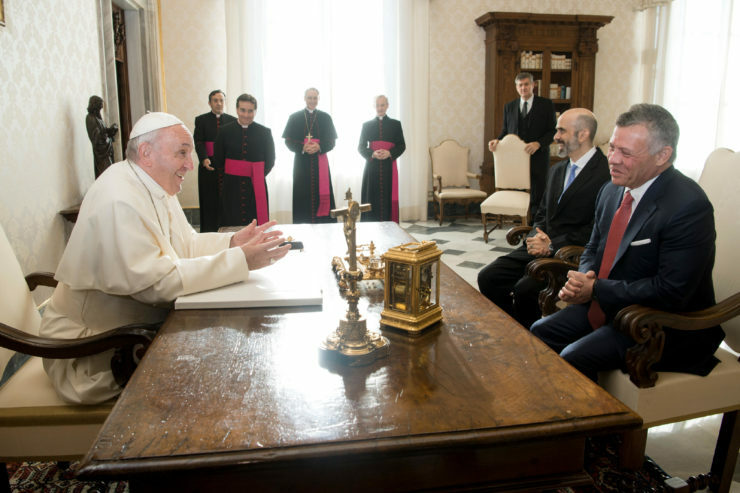 On Dec. 19, 2017, Pope Francis received in audience His Majesty King Abdullah II of Jordan. According to a communique released by the Holy See Press Office, the discussions with the king whose country the Argentine Pontiff visited in May 2014, during his visit to the Holy Land, were cordial. The importance of helping Christians remain in the Middle East, it also noted, was brought up, as was the positive contributions that they bring to the societies of the region. After meeting with the Holy Father, the president met with Vatican Secretary of State, Cardinal Pietro Parolin, and Archbishop Paul Richard Gallagher, Secretary for Relations with States.